GFI FaxMaker 2015 is leading fax server solution. FaxMaker is available as a total on-premise application, or hybrid application with hosted hardware. Easy to deploy, and fast on return on investment, GFI FaxMaker saves time and money. GFI FaxMaker 2015 licensing can appear to be a bit difficult to understand so I hope I can make it as simple as possible to understand. 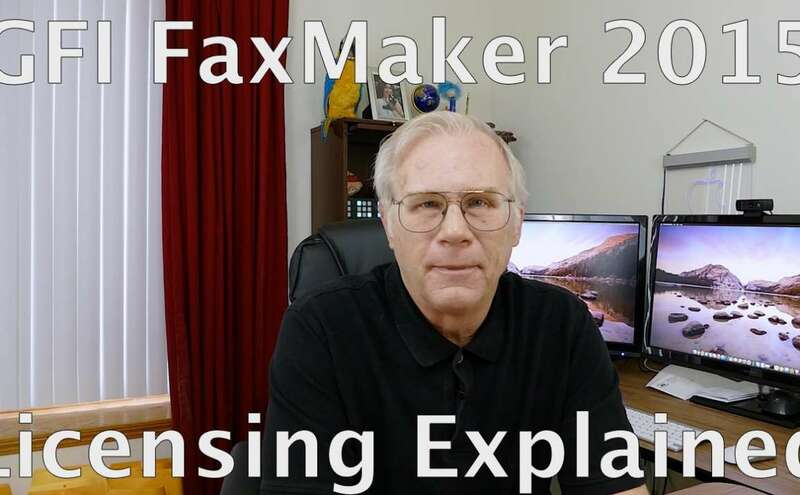 GFI FaxMaker 2015 is licensed by the number of users, the number of fax channels (fax lines) , and options such as the OCR module and or virtual fax hardware such as the SR140. Licenses are also available for additional servers as well. Recently I had the opportunity to participate in a GFI case study for the popular GFI FaxMaker software. Last Tuesday March 10th 2015, a video production company visited me in my home office to record the case study. They carried with them a ton of lighting and state of the art video gear. For those of you unfamiliar with the term “case study” here is the best way to explain it. A case study is an examination of how a customer uses a product, and how the product benefits their business, and or improves their business processes. What is PCI-DSS? It stands for Payment Card Industry Data Security Standard. PCI-DSS applies to all business that accepts credit card information, stores credit card information , or any information about the cardholder. Yes, even Mom and Pop operations fall under PCI-DSS regulations. My day job is a partner of GFI Software, Each day I speak to IT admins form very small to very large companies in North America, My focus is on Patch Management, Network Vulnerability Scanning,Windows Event Log Management, Securing network endpoints, W3C log management, as well as web security and email security. Network vulnerabilities are on the rise! Ensure your network devices are protected. The number of reported security vulnerabilities in 2013 continued to increase compared to 2012. Vulnerabilities are on the rise constantly increasing since 2011. The high severity vulnerabilities increased by 16 percent from 2012. IT resources in small and medium-size businesses are often limited and time savers are welcome. But some security short cuts may put your business at risk costing more than time in the long run. Here are five of the most common security mistakes SMB’s make and their simple solutions. ©2017 FB Security Group. All Rights Reserved.